The Schlossberg is an attraction. In springtime by fresh green, the first warm rays of sunshine, in summer by shady trees and open-air performances, in autumn by the blaze of colours, and in winter you can escape to it from dull routine in the city. And all that within a few minutes walking distance. Since 1894 the Schlossbergbahn funicular has mastered the gradient of about 60% perfectly - lately with new observation cars. On top of the hill there is much to discover. The Bell Tower dating from the 16th century. Inside it - the "Liesl", the heaviest bell of Graz. There is the casemate open-air stage in the former cellars of the destroyed main building of the fortress. A cistern, the Türkenbrunnen (Turkish well), 94m deep, and the mighty Stallbastei bastion were all built by Domenico dell'Aglio. 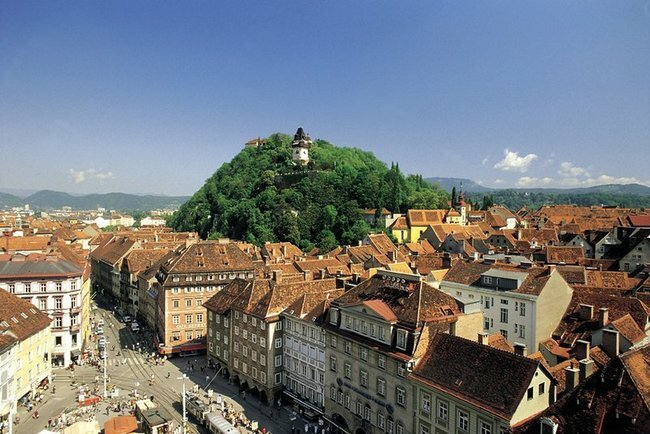 He was leading among the architects from Northern Italy who in the mid-16th century erected new city walls in Graz and a 400m-long fortress on Schlossberg. No one could take this fortress. Not even Napoleon. However, after a victory over the Hapsburgs in 1809, Napoleon demanded the demolition of the fortress. A huge amount of money paid to the French by the burghers of Graz could prevent the Clock Tower and the Bell Tower from being destroyed. Thirty years later, Baron of Welden transformed the former fortress hill into the romantic park with its southern plants, which it is still today. The c. 260 steps of Schlossbergtreppe lead you downwards. As does the glass lift which terminates in the Schlossberg tunnel system. The latter was built in World War II as an air-raid shelter for the people of Graz. Today it houses not only a grotto railway for the little ones but also the "Dom im Berg", an event and exhibition hall equipped with state-of-the-art technical infrastructure - and all that in the centre of a rock. 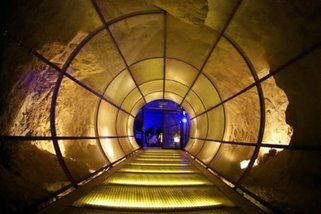 Elevate has two more breathtaking venues inside of the hill: The Dungeon (Uhrturmkasematte) and the Tunnel. Both venues can be accessed by takign the unique Elevator inside of the Schlossberg. Built in the early 2000s this magic ride will stay on your mind. As well as the venues which are caves and tunnels inside the rock. Forum Stadtpark - a very traditional and beautifiul art center - hosts the Elevate Festival's discussions, lectures, film screenings, workshops at the Elevate Lab and parts of the music programme.